Wow Wayne, this is an excellent visual for those who could not attend. How do you feel your room sounded with the 3pi's and flanking subs this year? Did you have to experiment (with placement) setting them up? About how far back was the listeners distance from he mains? My room sounded great, especially for a hotel room. To be honest, I've done this show for nearly 20 years now, so I have it down. I know exactly where to put my speakers and how to setup the equipment. I always bring either seven π constant directivity cornerhorns or three π or four π speakers with flanking subs. When I setup the DI-matched mains and flanking subs, I do it just like you see in the pictures in this thread. When I bring constant directivity cornerhorns, I put the mains in the front corners on the same wall as the entry door. And I set the subs back in the opposite corners, configured as distributed multisubs. In either case, the listening position is a couple feet behind the axes-crossing point, which is also a few feet away from the wall behind the listeners. 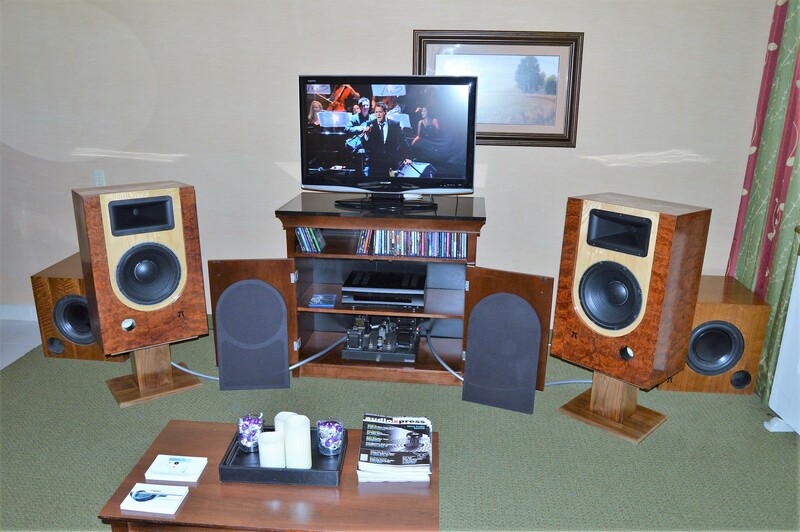 The rooms aren't large enough, but they still sound great when setup this way. All six surfaces (walls, floor and ceiling) are hard solid concrete, which makes room modes strong. But the multisubs/flanking sub setups really smooth the modes. The curtains and furniture help damp reflections in the statistical range. And since the speakers generate a tonally balanced reverberent field, the room doesn't sound nearly as bad as you would expect from having concrete everywhere. It actually sounds very good in our room each year. Thanks for the hospitality and the seat time at the show. Your room always sounds great. The photo above is a good one but it makes the 3 Pi's and the subs look more petite than they do in person. They have a real visual presence to them in real life. Got a nice note from Bob Brines. He's enjoying retirement and listening to tunes although it doesn't sound like he's doing any speaker building. His friend Bill moved out of town so he may not be inclined to do road trips alone. He sounded pretty upbeat. On the advice of a local (Jersey) chef, I took a detour to DFW airport to hit a place called Angelo's. It's in a slightly scruffy part of Fort Worth, has a bland exterior and the interior can be summed up by the word dive. Needless to say they had remarkable brisket. Nice detour. Around the corner from Angelo's was Doc's. They sell old stuff but seem to specialize in vinyl. Shame there wasn't time as I could have done some real damage in there. A lot vinyl just sitting their waiting to find their forever home. As always it's too long a schlep to and from Texas and yet it's always a great weekend. Thanks for the kind words on our room. I just love this show every year! It is a warm vacation for Kelly and I, and our Saturday evening dinner with you and the gang is always so much fun! Sounds like we definitely need to do Angelo's - both for the meal and for the chance to go to Doc's! I was sad that Bob Brines took a break from audio. But I'll bet he gets bored and comes back! This looks like just the sort of thing I would like to go to, except I am too late for this year! Also, it's a bit far for me to go (I am in London), still, maybe some day. I've always wanted to visit the US again, (I did so years ago), and I might as well have a good reason to do so. Meanwhile, I am looking up various festivals and markets that I might go to in Europe.